Human Capital Services is always thinking about continuous improvement. We introduced you to the PageUp Applicant Tracking System in 2016 and received lots of feedback on its functionality. You spoke; we listened. Statuses have been streamlined to be more clear and consistent. Below is a table of statuses that have been updated. 2. Search committee members and search chair functions are updated so applicants and application materials can be rated and viewed in one location. 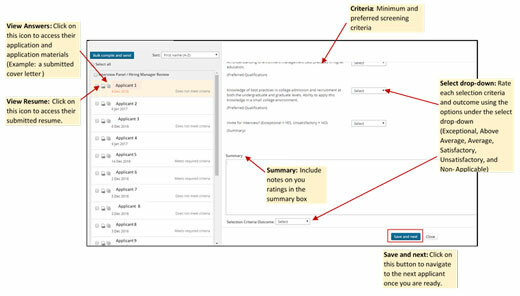 Below is an example of what a search committee member may see. We are revising the search committee instruction guides and will make them available by Jan. 17. 3. Human Capital Services is working to simplify the reference check process and are making progress toward automating reference requests through PageUp. How it will work: PageUp will automatically send out reference requests to the references when a candidate's status is moved to Reference Check. Current progress: The automated feature is currently available for faculty searches only. While HCS is working on this improvement, reference request functions through PageUp are unavailable for nonfaculty searches. However, if you would like to send a reference request through PageUp, your TA Strategic Partner can still send out them out for you — just let us know and we will bridge that process. HCS will continue to seek input on the process before we make it available to all searches. When Total Rewards is released, a new compensation structure will be available. Position descriptions currently in the system will need to be archived, but the information will remain. You will still have access to view your old position descriptions and can review it to create new positions descriptions going forward. HCS will continue to give updates on the impact of Total Rewards in the applicant tracking system as we receive new information. HCS is very enthusiastic about the updates and developments coming to PageUp in 2017, and appreciate your support and patience as we continue to work on improving the features based on input from university stakeholders. HCS looks forward to hosting its Innovation Session in late January with internal and external stakeholders. The purpose of the session is to listen to our stakeholders and allow them to share input on our future goals. Please contact your TA Strategic Partner if you have further questions or would like to provide feedback on updates.